Safety may be the toughest position to evaluate in football. The impact any given safety has on the rest of a defense goes mostly unquantified, and without the benefit of All-22 tape, it can go unseen too. What Devin McCourty brings to the Patriots is best understood through his relative anonymity during any broadcast. Each of his peers at the position seems to have a quirk to their games that cause them to stand out in some way. Earl Thomas’s disregard for his personal well-being is plain to see at least once a game. Jairus Byrd was implanted with a ball magnet in Buffalo. Nothing that like happens very often with McCourty, but game after game, he’s been in the back of the New England defense, his skill set helping dictate how the Patriots can build their coverages. New England was comfortable using a ton of single-high safety last season. Some of that is because of Darrelle Revis, but being able to rely on McCourty playing center field quietly lays the foundation. There are a lot of free agents this year who fit a similar bill — players whose impact on whatever team they choose may go largely unnoticed but is by no means any less significant. As a primer before free agency gets started, we decided to give a quick rundown on some of the subtler options that teams will be kicking around this weekend. 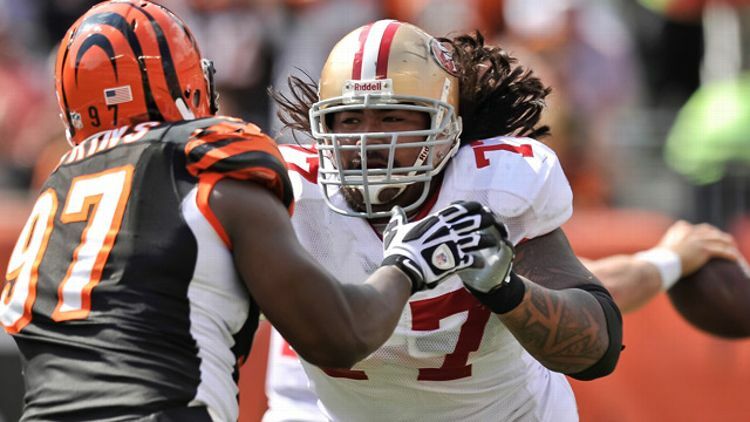 In 2010, Iupati was considered the best guard prospect to come along in years. Physically, he looks like the result of a covert government project — a Marvel hero in shoulder pads. He also moves absurdly well for someone checking in at 330 pounds. The Niners asked their guards to do a ton of pulling in Greg Roman’s offense, and Iupati never struggled with it, whether to the play side or coming across the formation. Someone who moves that well shouldn’t be allowed to have the brute strength this guy does. Initially, this doesn’t look overwhelmingly impressive, but just know that this is not an easy block to make. Few guards are trusted to reach a 3-technique to the play side without so much as a punch from the left tackle. He not only gets to the defensive tackle’s outside shoulder, but he manages to turn him too. It’s a combination of having a great first step and actually being the Hulk. What keeps Iupati from being among the league’s truly elite guards is that he tends to get lost in pass protection. There are moments when he becomes impatient, confused, or both. This is a simple stunt, one he probably sees every week, but he still fails to stay square, and it ends in a sack. Even with those issues, though, he’s going to receive a healthy raise this week. That’s what transforming the makeup of a team’s running game will get you. I’m a fan of McPhee’s haircut. It has nothing to do with style, but without it, finding him on film wouldn’t be easy. There are only so many players who could line up in any gap on a given play, and McPhee is one of them. 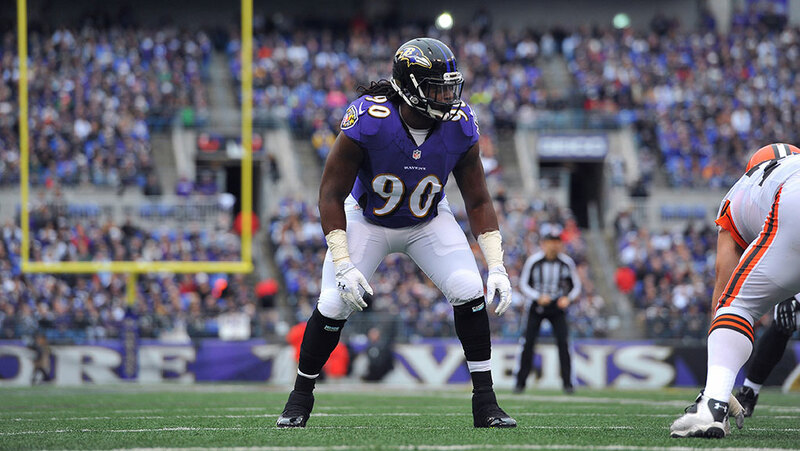 He did a lot of his pass-rushing damage inside for the Ravens, both standing up and with his hand on the ground. McPhee is a classic case of how falling between positions can sometimes be an advantage. At 280 pounds, he has quickness over most guards without sacrificing the bulk to hold up against the inside run. What worries me about McPhee is how a team goes about using him when he’s making $9 million a year as its best or second-best pass-rusher. Players making that kind of money typically end up coming off the edge, but that seems like a waste of McPhee’s versatility. He could end up a case study in how a part-time player’s value might change when he’s asked to take on a more significant role. Part of McPhee’s effectiveness last year came from his ability to surprise offensive tackles with power, but if he’s seeing Joe Thomas for 50 plays a game, that opportunity to be a change-of-pace rusher goes out the window. Teams need to keep that in mind before opening the vault. Anyone who listens to The Grantland NFL Podcast knows that Graham has long been a favorite of ours. His snaps dropped off significantly after the Eagles made the shift to Bill Davis’s defense, but his per-snap efficiency has remained fantastic. Any 4-3 team looking for pass-rush help — the Bucs, the Bengals, the Falcons — would be lucky to get him. He looks natural bending back toward the quarterback from the outside, he uses his hands well, and he has a full set of moves. When he was getting more run in 2012, one of his favorites coming off the left side was a type of delayed dip. After engaging with a tackle and coaxing him into shifting his weight forward, Graham dips his inside shoulder and slides outside. It worked twice on Andre Smith in this game — probably the best night of Graham’s career. His value comes mostly as a pass-rusher, but he’s also a net positive against the run. Graham weighs only 265 pounds, but it’s all packed into a relatively stout 6-foot-2 frame. He’s more than capable of setting the edge in the running game, and there are even times when he bumps inside in pass-rush situations. My favorite part of watching Graham play, though, is that he just doesn’t stop. If his first move falls flat, he’s on to his second, and maybe even a third. Sacks can be fluky in how they reflect pass-rushing talent, but they can also be an indicator of who finishes plays. Graham finishes plays. 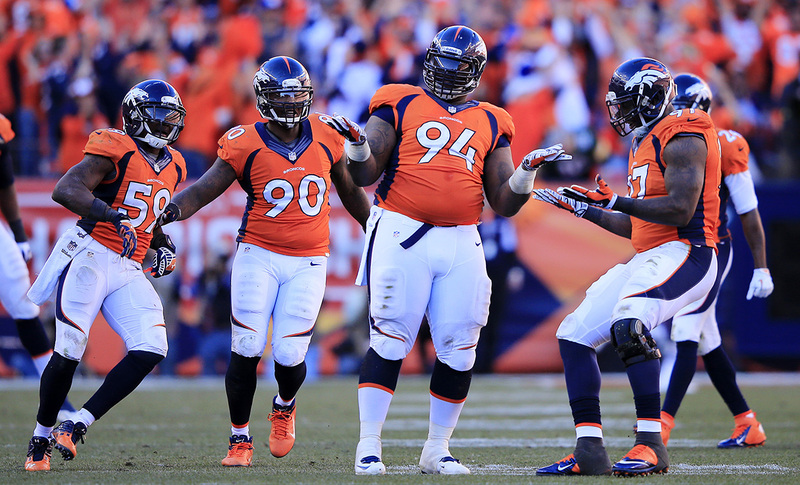 It’s surprising that we’re talking about Knighton at all this week. By the time the Broncos got to the Super Bowl two years ago, he was playing as well as any player on their defense and seemed a lock for an extension. He took a slight step back last year, but he still represents an upgrade for many teams with money to spend. Knighton isn’t explosive as a pass-rusher and he isn’t going to push the pocket like a Nick Fairley type, but he can be a serious headache against the run. First, he is a wide man. Knighton’s lower body allows him to anchor down as a nose tackle and withstand any efforts to move him. But he’s more than just a space-eater. Knighton has strong and agile hands, and after sticking centers and guards at the snap, he’s looking to get rid of them and make plays. An added luxury is that he can play in a variety of schemes; it wouldn’t be a surprise to see him end up with one of his old coaches — Jack Del Rio in Oakland or John Fox in Chicago — who know exactly what they’d be getting. I’d be curious to see what type of deal Wisniewski turned down from the Raiders so he could hit free agency. Reggie McKenzie has a Scrooge McDuckian pool of gold coins to throw around, so it’s not as if Oakland didn’t have a chance to bring Wisniewski back. There should be a market for Wisniewski at center, but he also has some history and a good track record at guard, where he started his entire rookie season. As a center, he’s definitely more valuable in the run game than as a pass protector. He moves well enough to get to the second level, but he’s also strong enough at the point of attack to force movement on defensive tackles without any help. One spot worth keeping an eye on is Houston. The Texans just cut Chris Myers after seven seasons, and Wisniewski is closer to the type of lineman Bill O’Brien had during his time in New England. He’s able to survive in both man and zone schemes, and in a pinch, he can play all three spots on the interior of the line. 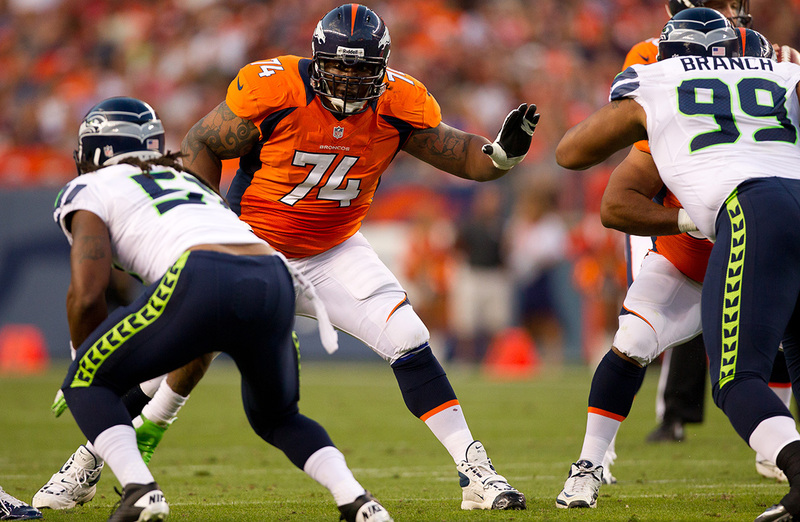 For most of 2013, Franklin was a reliable option as the Broncos right tackle on their way to the Super Bowl. That’s until Cliff Avril lit him on fire in front of more than 111 million people. Franklin made the move to left guard last season as part of Denver’s offensive line shakeup, and after a slow start, he really settled in. Not surprisingly, considering his experience at tackle, Franklin has excellent feet for a guard. This is just a perfect first step as he’s tasked with reaching a 3-technique to the play side. How his left foot moves at the snap is what lets him to get to the second level and eventually allow C.J. Anderson to pick up 16 yards. The concern with a player Franklin’s size — he’s 6-foot-7 — when moving to guard is being able to create leverage with that massive frame. That’s a side of the position Franklin really pinned down in the final six weeks of the season. He has the chance to be a valuable piece for a team looking for positional versatility in its linemen. In a single play, it’s possible to understand the puzzle that is Derrick Morgan. 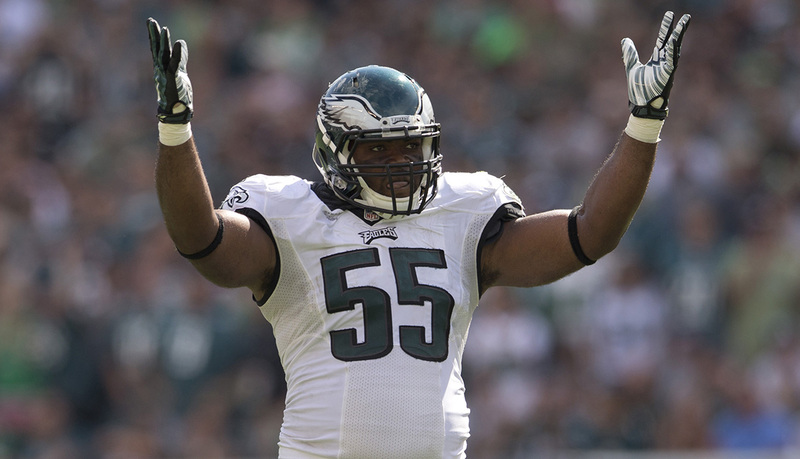 I love Morgan as a player, but after being selected in the first round in 2010, he’s never topped more than 6.5 sacks in a single season. He’s a perfect example of sacks not telling the entire story. When Morgan is affecting plays as a pass-rusher, he’s often doing so like in the play above. He converts speed to power very well, and it allows him to walk talented tackles right into the quarterback. Morgan’s deficiency is with his hands. Great pass-rushers who rely on power moves are also adept at shedding blockers and spilling back to the inside to finish off plays. That’s where Morgan struggles. Physically, he has all the traits that make a top-flight rusher, but he’s still lacking refinement. Last year was his best season rushing the passer, but because the Titans had him dropping back into coverage often, it hurt his raw sack totals. He may not have the numbers some of the other available guys do, but he consistently alters the pocket. I think his best seasons are ahead of him, and that is always what teams want in free agents.